“Stop that, why did you choose me?” Whimpered Samantha. “Did you really have to ask that, I mean the answer is pretty obvious,” laughed Cara. Cara, Judy and Alisyn shoved by, flicking their hair in the usual way. Sammy rushed towards the bus with her face buried in her hands.She pushed her blonde hair away from her face and stepped on the bus. “Oh Sammy, The Cara Crew again?” That’s what Sammy and Calli called Cara, Judy and Alisyn. “Don’t even say their name! !” Replied Sammy . The rest of the ride was silent. When Sammy got off the bus she breathed in the scent she wished was horse, but sadly was chickens. “It was OK, I guess. It would have been better if it weren’t for The Cara Crew,” Said Sammy, lowering her voice. Keera was a twelve year old barnhand whose school was only a block away, so she got home half an hour before Sammy. She absolutely adored chickens. What Sam didn’t understand was that they had an old stable behind the chicken barn and yet not enough room and money for a horse was always the excuse. Sam was brushing her hair and applying cream to her smooth, tanned skin when she heard her 11 year old brother, Braiden calling her, Keera, their dad and the rest of the workers in for dinner. At dinner everyone was very talkative, everyone except for Sammy . “What’s wrong Sam?” Asked Travis, her dad. “My Life!” She shouted. Sam rushed off to her room and slammed the door violently. She hid her face in her pillow. She cried for a moment until she heard her boxer, Dusty, scratching the door. “Come Dusty,”Sam told him. Dusty wandered in and layed down on the bed. “At least I have someone who understands,” Sam expressed to the dog. She slowly stumbled down the stairs with a plain look on her face that immediately turned to a smile when she saw Calli. “Come here!”Calli convinced Sam. They walked outside towards the nursery for the chicks. “Hey listen, I-I r-really like you,” stuttered an awfully familiar voice. Who was it? Then it hit her, Braiden was telling Keera about his feelings for her. “I feel the same way,” whispered Keera, “Let’s go out on Friday night.” Braiden looked over towards Sammy. “Sammy, get lost!” Braiden bellowed. The 2 girls ran away into the forest and were running for at least a kilometer before they stopped running. “Stop!” Sam hollered stopping dead in her tracks. “Well, it is getting late, let’s go,” Sam replied, the excitement draining out of her. They got back to the house 45 minutes later and decided to fix the barn anyway. They grabbed a drill, some planks of wood, nails, screws and a hammer. Then they got Juli, Sam’s mom, to drive them into town to buy the rest of the supplies. The first thing they did when they got home was rip off the roof and replaced it with a new roof. Then they tore off one wall and replaced it with new fresh wood. They did that to all the walls then painted them red. Next they put in new window frames and windows. Finally, the last touch for the outside, the door. They put a new slide door on and painted it green. When Sam’s dad came out he took one glance, then was full of questions. “What have you ladies been up to?” He asked. “I’ll take the honors,” replied Sam. Sam opened the barn door and got a whiff of dust in her face. “Wow, this’ll take forever!” Cried Sam reluctantly. “Hey, if we work together it’ll only be a couple hours and together we can make it a blast,”said Calli, trying to comfort her friend. When Sam finally agreed they got to work. First they swept the upstairs and organized a hay spot, a feed room for the grain and a tack room. Then they filled the hay spot with some bales of hay and straw they had bought when they were out. They also put some grain into their feed trunk, and other vitamins. They replaced lights, windows and a couple of loose boards but other than the empty tack room, the upstairs looked great. Sam and Calli swept the aisle, replaced the stalls wood and cleared out the dust. They placed automatic water buckets in 4 of the stalls and filled those 4 stalls with, cow mats on the floor so they didn’t trip, straw, a feed bucket, hay and a toy jollyball. They were finally done with the barn! They filled the tack room with the supplies they had purchased, such as leadlines, halters and leg wrap. They also stored some linaments in there. “Now let’s just hope that my parents let me buy a horse,” Sam exclaimed. “What! You haven’t asked yet? We could have done all this work for nothing!” Calli sceamed. Samantha looked away. “Well, bye,” Calli said, breaking the silence, and she left. The next day after school Calli showed up. “Up for a hike?” Calli asked, obviously not holding a grudge about the other night. “Hear what?” Calli said puzzled. “Nevermind,” Sam replied quietly. They kept walking and this time Calli and Sam heard it. They looked at each other and practically read each others minds. They dashed into the forest and couldn’t believe their eyes. 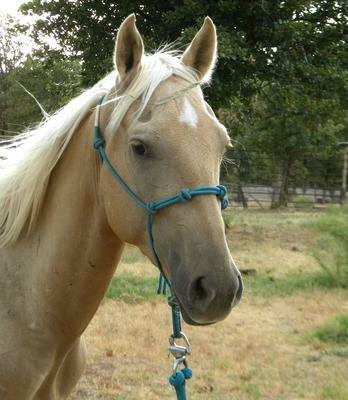 There was a old and abandoned slaughterhouses and tethered up to a pole so tight she couldn’t move, was a sad looking honey-coloured Palomino mare.